Washing clothes can be a mindless task. Make a routine feel impactful in 5 easy steps. It is not a surprise that the fashion industry is incredibly wasteful and harmful to the environment. Yet, if you thought plastic was bad, the very machines we use in our homes are just as damaging. If you guessed washing machines, you’re right. When washing, garments release half a million tons of microfibers into the ocean, which is the equivalent of more than 50 billion plastic bottles. The microfibers are near impossible to clean up, and can enter food chains harming us, as well as marine life. What can you do? Buying with longevity in mind is one way to help slow down this damage to our planet and health. Up to two-thirds of clothes’ carbon footprint occurs after you take it home, which is good news because this means it’s up to us to make change which can be done in a few simple steps. 1. Only wash as needed – Next time you feel lazy about not doing a wash, and instantly feeling obligated to do a load of laundry, sit back down, put your feet up and pat yourself on the back for being a smart washer. 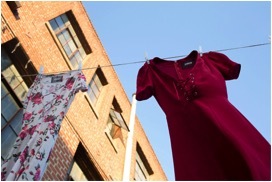 Re-wear and re-use clothes as many times as desired without feeling dirty. Not only are you saving water this way but your also saving the life and longevity of your clothes the less they are continuously washed. 2. Skip the dryer – Avoid the dryer when you can, and try hang-drying your clothes instead. In fact, machine drying is not recommended at all for denim. To save the color and longevity of your denim, begin air-drying the next time you go to do a wash, especially for black denim! 3. Cold water – When you do a wash set the water to “cold” to save energy and help clothes last a little longer. Heat breaks down fibers. 4. Spot cleaner- Tell your BFF to move aside for the spot cleaner! If there is a stain in one visible spot, don’t waste water by throwing it in the laundry, use spot cleaner. 5. Denim – Try bagging and putting it in the freezer for a day or two, this will kill bacteria and odors as well as keep your jeans in better shape. Consider it a science project! Join Reformation and other sustainable brands like Indigo Apparel in efforts to shop smart and live responsibly. It is in our hands to make change!